Whenever a cash income distribution (either an interim or final income distribution) is announced, the Board of Directors ("Board") of the management company of Axis-REIT ("Manager"), may, in its absolute discretion, determine that the IDRP will apply to the whole or a portion of the income distribution (called the electable portion) and where applicable, any remaining portion of the income distribution will be paid in cash (called the remaining portion). Choose to receive part of the electable portion in cash and reinvest the remaining part of the electable portion in new Units credited as fully paid-up at an issue price to be determined on the price-fixing date in the proportion determined by the Board in its absolute discretion. Will I still have withholding tax deducted? All gross income distribution with respect to the electable portion and the remaining portion will still be subject to the usual withholding tax. The net income distribution (net of withholding tax) will either be paid in cash and/or reinvested in new Units at its equivalent amount (as the case may be). There is no tax advantage to be gained by Unitholders in any of the abovementioned options elected. Will the Units I receive be at a discount? Unitholders will be able to receive new Units at an issue price with an implied discount. The issue price of such new Units to be issued under the IDRP shall not be priced more than 10% discount to the five (5)-day volume weighted average market price (VWAMP) of the Units immediately before the price-fixing date. Price-fixing date shall mean the date on which the issue price of the new Units to be issued under the IDRP is determined by the Board. When will I get my new IDRP Units? An announcement on the book closure date (entitlement date) will be made on the price-fixing date. Subsequently, notices of election containing details of the IDRP and information memorandum (which was applicable only at the commencement of the first IDRP implemented in 2011) will be despatched to entitled Unitholders. The expiry date which is the last date for the entitled Unitholders to make an election in relation to the electable portion, will be stated in the notice of election. The entitled Unitholders will be given at least fourteen (14) days from the despatch of the notice of election to submit the completed notice of election. Within eight (8) market days from the expiry date, or on such date as may be prescribed by Bursa Malaysia Securities Berhad, Axis-REIT will allot and issue the new Units under the IDRP on the allotment date. The remaining portion and the electable portion (where Unitholders choose to receive the electable portion or part of the electable portion in cash), as the case may be, will be paid to the respective Unitholders in the usual manner. An announcement will also be made on the listing of and quotation for the new Units to be issued under the IDRP on the Main Market of Bursa Malaysia Securities Berhad. As the new Units to be issued under the IDRP are prescribed securities, the new Units will be credited directly into the respective Central Depository System accounts of the Unitholders and shall, upon allotment and issue, rank equally in all respects with the existing Units. However, the new Units will not be entitled to any distributable income, right, benefit, entitlement and/or any other distributions that may be declared before the allotment date. What is the Board's authority in respect of the application of the IDRP? The Board has full authority to determine if the IDRP will apply to a particular income distribution. If the Board has decided not to apply the IDRP to a particular income distribution then the income distribution declared in that quarter/period concerned will be paid in cash to the Unitholders in the usual manner. The maximum number of new Units to be issued under the IDRP will depend on the Board's decision on the size of the electable portion, the total number of Units held by Unitholders who elect to reinvest the electable portion in new Units and the issue price which will be determined by the Board on the price-fixing date. What happens if I elect not to participate? If Unitholders do not expressly elect in writing to participate in the IDRP, they will receive their electable portion in cash. As such, Unitholders need not take any action if they wish to receive their electable portion entirely in cash. Does the Board have the authority to cancel the availability of the IDRP? Notwithstanding any provision of the IDRP, if, at any time after the Board has determined that the IDRP shall apply to any income distribution and before the allotment date in respect of the electable portion, the Board considers that by reason of any event or circumstance (whether arising before or after such determination) or by reason of any matter whatsoever, it is no longer expedient or appropriate to implement the IDRP in respect of the electable portion, the Board may, in its absolute discretion and as it deems fit in the interest of Axis-REIT and without assigning any reason thereof, cancel the application of the IDRP in relation to the electable portion. In such an event, the electable portion shall be paid entirely in cash to Unitholders in the usual manner. All Unitholders are eligible to participate in the IDRP, subject to the restrictions on the Unitholders with registered addresses outside Malaysia as at the relevant book closure date for the income distribution to which the IDRP applies. 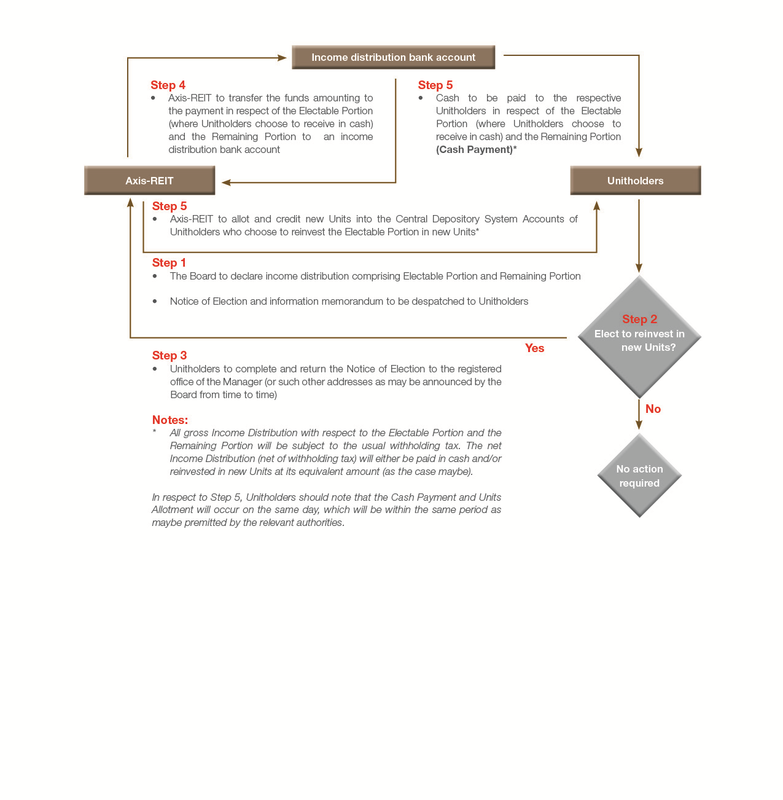 This is also subject to the requirement that such participation by the Unitholder will not result in a breach of any other restriction on such a Unitholder's unitholding in Axis-REIT which may be imposed by any statute, law or regulation in force in Malaysia or any other relevant jurisdictions, as the case may be, or as prescribed in the Deed constituting Axis-REIT. A Unitholder who elects to reinvest the electable portion in new Units to which his notice of election relates, may receive such new Units in odd lots. Unitholders who receive odd lots of new Units and who wish to trade such odd lots on Bursa Malaysia Securities Berhad should do so on the Odd Lot Market, which allows trading of odd lots with a minimum of one (1) Unit. Can the IDRP be terminated? The IDRP may be modified, suspended (in whole or in part) or terminated at any time by the Board as the Board deems fit or expedient by giving notice in writing to all Unitholders. What are other issues relating to the IDRP? It should be noted that the grant of the right to participate in the IDRP is made to all Unitholders, including the directors and major shareholder of the Manager, major Unitholders and persons connected to them who hold Units. The net proceeds from the IDRP (after deducting estimated expenses for the IDRP) will be utilised to refurbish and/or renovate the properties in the portfolio of Axis-REIT, and/or for any other purpose(s) that the Manager and the trustee of Axis-REIT deem fit and in the best interest of the Unitholders. The refurbishment and/or renovation of Axis-REIT's properties are expected to enhance the future income to be generated from the said properties moving forward. A Unitholder's unitholding in Axis-REIT will be diluted if he/she chooses to receive the electable portion (or part thereof) in cash. The extent of such dilution will depend on the size of the electable portion, the total number of Units held by the Unitholders who elect to reinvest the electable portion in new Units and the issue price which will be determined by the Board on the price-fixing date. The total amount of income distribution to be declared, the size of the electable portion and, consequently, the maximum number of new Units to be issued under the IDRP would depend on the financial performance and cash flow position of Axis-REIT and prevailing economic conditions. The size of the electable portion will be determined by the Board in its sole and absolute discretion from time to time.